We are delighted to announce an exciting new comic re-telling of the classic family tale Swiss Family Robinson as our 2019 Christmas show, created by multi-award-winning comedy theatre company New Old Friends and directed by James Farrell (RSC and The 39 Steps in the West End). New Old Friends have won national acclaim for their particular brand of entertaining and engaging theatre and this new production will be overflowing with creativity. Delivered by a cast of just four talented performers, the show will feature stunning ship-wrecks, wonderful wild animals, glorious gags, marvellous machines, stupendous songs and witty wordplay, making it the perfect festive family island escape this December. 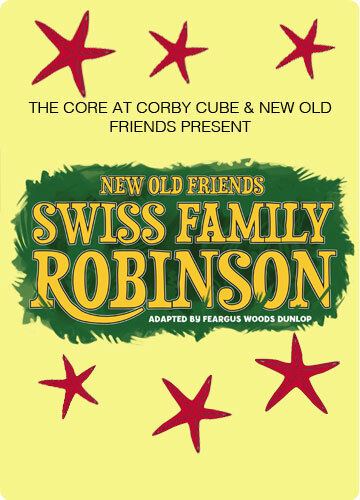 Commenting on the show Heather Westwell, Artistic Producer of New Old Friends, said “We are delighted to be working with The Core at Corby Cube, and couldn’t be more excited about the way we plan on presenting this beloved family story in a completely new light. The Swiss Family Robinson have to engage every ounce of creativity to survive on the island, and this co-production revels in that license to create. It should be a hilarious treat for all ages”. The Core’s Director Joe Flavin added “We are absolutely thrilled to have New Old Friends with us for Christmas 2019. The company’s mad cap and hilarious comedic style has delighted Corby audiences with their recent tours to The Core with Crimes Under The Sun and Crimes On The Nile. Swiss Family Robinson is a classic family story book of shipwreck and survival that no doubt has featured in all of our childhood Christmas stockings. This year we set sail on the high seas with New Old Friends to bring a real sense of wonder and adventure to Corby this Christmas”.